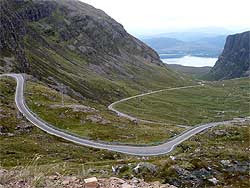 The road west over the hills to Applecross, on the north-west coast of Scotland, is Britain's longest steep hill. Simon Warren's recent book on Britain's top 100 cycling hills rated every one out of ten; this one rated eleven. The hill is Bealach na Ba, usually translated 'Pass of the Cattle', but I prefer 'Cow Pass'. 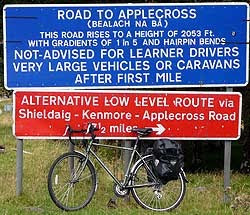 Bealach is the Gaelic for 'pass', pronounced rather like someone unexpectedly throwing up, which is appropriate. The sign at the bottom - a candidate for Britain's most verbose - sternly warns learner drivers and caravans off its jackknife hairpins and vertiginous gradients. The road was built in 1822, and they were clearly made of stern stuff then: it rises from sea level to 616m over a distance of 9km - or 2,053 feet in five and a bit miles in old money - giving it an average gradient of 7%, or 1 in 14 in imperial. It's Britain's most Alpine ascent, getting steadily steeper and steeper as it staircases up the wall of the pass, with the dramatic switchbacks at the top reaching 1 in 5. But - yesterday, anyway - it was sheer delight to cycle up, from this tourist's point of view, stopping frequently to take pictures and swig water, and wave at motorcyclists hurtling to the summit. From the viewpoint at the top you have the magnificent skyline of the Cuillin ridge, keenly observed by people sitting inside motorhomes. 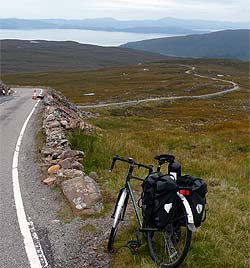 The other side - down to Applecross - is a whizzy adrenaline rush, with good sightlines, mostly easy corners, gentler gradients than the eastern ascent, and long straightish bits: five, maybe six miles of freewheel. And there's a pleasant pub in Applecross with a beer garden on the edge of the loch, and a fine view of Red Cuillin - that's the Skye Brewery beer, not the peak. This, you see, was my birthday present to me. You are surely not trying to suggest that this is a more attractive cycling environment than Cambridge? Happy birthday indeed. And thanks for this blog. Did you do the coastal road on the way back? Some pretty serious, albeit shorter, hills there. @Dave - yes, from Applecross I headed north up the lonely coastal road (only built in the 1970s, apparently) to Torridon, which was extraordinarily beautiful. I was also delighted to find some decent Scottish beer for a change: Skye brewery's Red Cuillin ale, which I decided to make the official beverage of the trip. 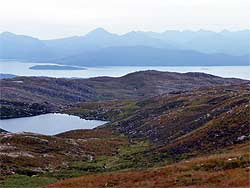 Ridden over there a couple of times, the last in the pouring rain on the "Bealach Beag" sportive a couple of years ago. The descent at speed with misted up specs was interesting! There are a couple of other "decent" (as you put it) Scottish beers - try the Black Isle Brewery's Red Kite, or the Orkney Brewery's Northern Light (personal favourite atm) and Raven ales. @Anonymous - I've tried Black Isle's Red Kite, and indeed dropped in on the brewery last year when I was cycling a Scottish coast-to-coast. Well, I say brewery; it's more like a shed. Most enjoyable. Don't know Raven Ales though - will check out next time I'm in Orkney. Thanks for tip. Also, a belated happy birthday. Colonsay brewery employs 10% of the island's working population! (Mike and Bob)!